K.M. Soehnlein's trenchant, emotionally honest debut novel unfailingly captures the spirit of a generation and an era. 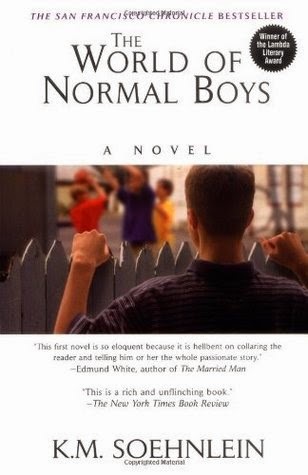 "The World of Normal Boys" is told in the haunting voice of thirteen-year-old Robin MacKenzie, a modern-day Holden Caulfield, whose struggle for a place in the world is as ferocious as it is real.It is the late 1970s in suburban New Jersey, and while "normal boys" are into cars, sports, and bullying their classmates, Robin Mackenzie enjoys day trips to New York City with his elegant mother. He dutifully plays the role of the good son for his meat-and-potatoes father, even as his own mind is a jumble of sexual confusion and self-doubt. But everything changes in one, horrifying instant when a tragic accident wakes his family from their middle-American dream and plunges them into a spiral of slow destruction. As the MacKenzie family falls apart, Robin embarks on an explosive odyssey of sexual self-discovery that will take him into a complex future, beyond the world of normal boys. I've read lots of coming-of-age stories, but none have dredged up as many sweet and painful memories as this one has. The author has done an amazing job bringing the 70's to life and creating a character that is so believable and so easy to identify and connect with. Robin MacKenzie is 13 years old and living in a New Jersey suburb with his parents, brother and sister. In many ways he is a typical teenager, wanting to make friends, fit in, and be “cool”. Though Robin is gay, this is a truly universal story about growing up, discovering one’s sexuality, and finding one’s way in the world. It is about friendship, family relationships, grief, guilt, and coping with loss. There are a variety of well-drawn and dynamic secondary characters with their own baggage that make Robin’s life difficult and help contribute to his growth. This is a wonderful, thought-provoking, rich and compelling story that very accurately portrays the life of a confused and troubled teen.